The history I write is no more strange nor less likely than the history I encounter. It may well be, though, that my credibility as an “historian” is compromised by efforts like Agincourt; on the contrary, I hope that a case for greater credibility can be made because of it. The Patlajan clan oozed creativity. In addition to Salomon (born 1890) the painter, there was also Naum (born 1888) the sculptor. Two others from that same neighborhood—Chișinău, Moldova—made claims of artistic inclination: Suzanne Patlagean Espe (born c1896) “artist: designer” and Alexandre Patlajean (born c1903) “artist: sculptor”. These we know because U.S. immigrant arrival forms include occupation, among other useful bits of information. But how many others never crossed the Atlantic and thereby slipped beneath our radar? Naum [an Eastern European hearing of the biblical name Nahum?] Patlajan may have been the most artistically successful member of the family. A brief published biographical sketch offers some dated events—some of which cannot yet be verified—and the Library of Congress and google.books yield a long list of exhibit catalogues. It was Naum who is credited with study at the art academy in Chișinău. Indeed, when the founder of the school was celebrated, Naum sent a reminiscence from his Paris studio back to his native Moldova. By this time, his name had also morphed and become Numa Patlagean (perhaps a French hearing of the family name, i.e., the way it should be spelled in French to achieve a proper pronunciation). Several claims in this short bio can’t be verified, easily if at all. He is reputed to have emigrated, first to Switzerland and then to Paris early in the century. And during World War I, Naum is supposed to have sheltered in “America”, which may mean the U.S. or Canada. Immigration records say nothing about an arrival during 1914-1919, but they do record his arrival in the fall of both 1928 and 1929. So what are we to make of a purported American visit ten years earlier? There are also claims that he taught at both the Sorbonne and at Weimar, both of which might prove true. Salomon (a.k.a. Gabriel Spat)—other than the coincidence of birthplace, religiosity and family name, I can’t yet claim brotherhood for Salomon and Naum—made an early choice to change his name more drastically. There are no known works signed any other way that “Spat”, for example, perhaps a way to distinguish or even separate himself from a countryman of identical surname. Both chose Paris as an adopted home. Both fled south to Antibes when the Nazis occupied Paris. Both sought refuge across the Atlantic—though for different wars. And both have added spice to my summer. 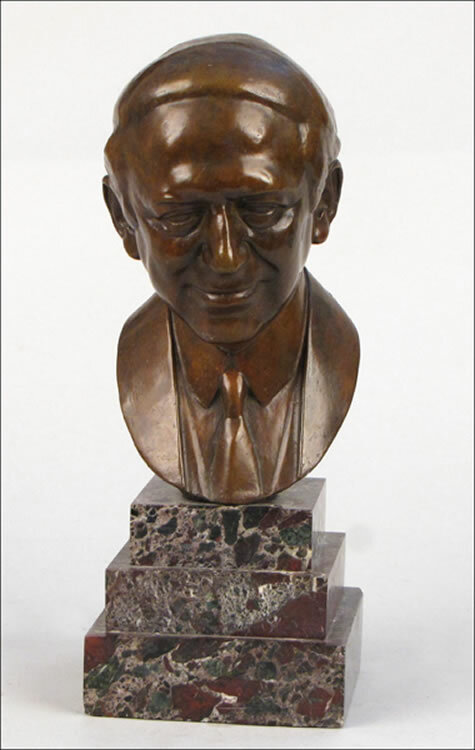 Incidentally, here is an example of Numa’s sculptural ability—a portrait bust of Alfred Smith, unsuccessful presidential candidate in 1928. A visit to the inter-library loan desk this morning rekindled the fire under Gabriel Spat (a.k.a. Salomon Patlajan). I couldn’t resist sharing. Artist Gabriel Spat has not been treated well by history. During his last fifteen years, Spat enjoyed some success in the art worlds of both New York and Paris. Catalogues from each city include lists of private buyers who had a Spat or two hanging on their walls—lists including familiar names from American history (familiar to me at least) and a few that will be recognized by everyone: Mrs Robert F. Kennedy and the Duchess of Windsor. At one time, apparently, he had been fashionable. Let’s hope that translated into financial security. Commercial success doesn’t often translate into historical recognition, however. Art historical texts are silent; catalogues from gallery shows are ephemeral; and the handful of printed and on-line biographical sketches compound old rumors about Spat’s origin and clarify little. I doubt that Gabriel Spat matters to many who don’t own one of his works. That being said, there are a surprising number of Spats that come up for auction—nearly a hundred lots in thirty years—though no more than five or six in an average year; his peak was 2009. Finding Gabriel Spat was a happy accident. Finding out about him requires conscientious effort. dogged sleuthing and a little old fashioned luck. Any moderate success I’ve had depends on the latter two. It’s both amazing and amusing how easily the most repeated claim about him can be undone. The consistent theme among Spat’s biographies is ambivalence about his place of birth: hesitant claims are made for both the United States and France. Yet ten minutes in on-line genealogical records settles the question. Spat’s 1948 application for naturalization yields his date and place of birth—13 July 1890 at Kishinev, Romania—with one significant bonus: confirmation of his change-of-name. Before that date his legal name had been Salomon Patlajan (pronounced, I am told with authority by Larry Carcoana, as “PAHT-la-zhon”). Armed with new information and fortified with these few incremental accomplishments, more dated events came forward—summarized in the previous blog entry. There’s nothing magic here; just a few standard resources available to everyone: 1) ancestry.com (the cheap library-based version); 2) WorldCat (a.k.a. OCLC, for “old school” research types like me); 3) NYTimes.com for its search engine and then off to MSUM and their microfilm reader-printer; 4) the indefatigable staff of NDSU’s inter-library loan office; and, of course 5) the full complement of google search engine tools, particularly google.books. At one point in my life I foolishly believed people would pay me to do this. I was wrong. Often I can’t reconstruct the path that takes me an answer. So, Wednesday morning at ILL one of my requests was sent back for more information. I couldn’t recall where I’d seen the factoid in question, but that sent me off in new directions toward another breakthrough. 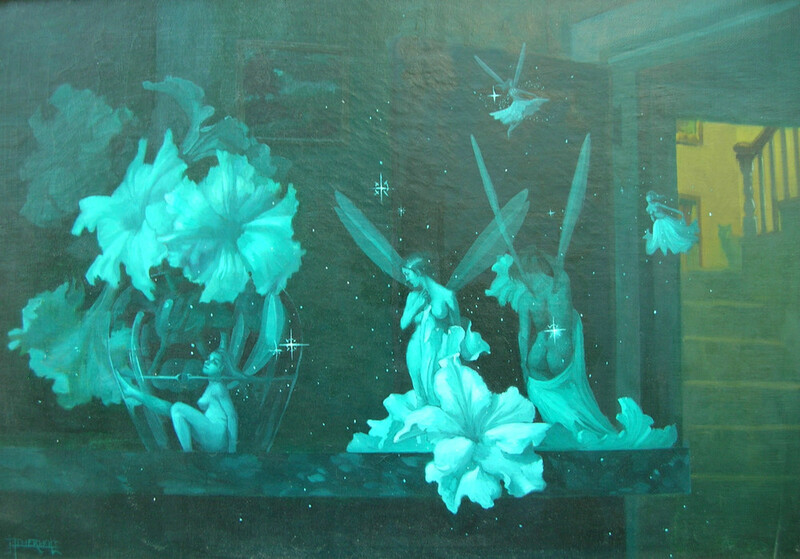 Spat had been born in Moldova when it was a part of Romania, but so had another artist—Naum Patlajan, a.k.a. Numa Patlagean—just two years earlier in 1888. Of him, there is more detail on the early years while he studied at the art school in the provincial capital. Naum was a sculptor who also emigrated to the Paris art scene and Naum also fled to the south of France when the Nazis invaded. Remarkably, he settled at Antibes and it was Antibes that appears as Spat’s last permanent residence on the 1942 passenger manifest that records his first known arrival in the U.S. I know this is tedious, but stick with me. Having learned of a long-lived school of art in Kishinev/Chesinau, I suddenly found myself in need of a Romanian and decided to make a quick trip to Zerr-Berg Architects and their star employee Lawrence Carcoana, NDSU graduate and genuine Romanian emigrant. I don’t know Larry’s path from the Homeland to America, but he confirmed for me the two principal paths that others have taken: exiting Europe during the Nazi era through two ports: Lisbon, Portugal and Casablanca in Morocco. The latter was Spat’s window to the West. The path forward now depends on Mr Carcoana’s willingness to help penetrate the archival resources of eastern Europe. My current quest is an email for the school in Kishinev and the hope they will cooperate. Wish us luck. There is something I want to tell you. It’s about Gabriel Spat, artist who painted “Portrait une famille” that I’ve repurposed for the “Landscapes & Livestock” portion of the next Agincourt exhibit. But this is also about scholarship and my heathen commitment to it. Gabriel (Gabrille) Spat was born in New York City in 1890. He lived and worked both in the U.S. and France, creating market, park, and horse racing scenes, still-lives, and portraying dancers in an impressionist style. This for an artist with ninety-five auction citations; his record price came from a Christie’s auction in 1988. Various commercial galleries (i.e., not museums) repeat this bio word-for-word. One of them lists him as “Gabriele” and uses feminine pronouns. Gabriel Spat was an American artist who spent most of his artistic career painting in France. His finished paintings were shipped back to dealers in the United States where they were sold to many collectors. Spat’s work is impressionist, distinguished, and sensitive and in the classical French tradition. In 1944, Spat came to America and had many successful exhibits in New York, Chicago, Palm Beach, Montreal, San Antonio and the east end of Long Island, NY in the Hamptons. He was known for his charming genre paintings which included horse races, boulevard and promenade scenes, as well as ballerinas, garden scenes and people strolling along the beach. Gabriel Spat spent most of his career in France painting small oil and watercolor figural works and scenes of leisure life at such locales as racetracks, parks, and beaches. Little is known of the artist’s life, but he probably was a native of France. Spat was painting by the age of eighteen, but as an art student in Paris he was so impoverished that he was forced to paint on scraps of canvas given to him by other artists. As a result, he learned to paint in miniature, and he continued to work on a small scale throughout his career. Spat’s intimate views of Paris undoubtedly were aimed at the tourist market. They present the city in its most famous and agreeable aspects in such themes as strollers along the banks of the Seine River and blossoming chestnut trees along streets and in parks. Spat fled to the south of France in 1940, during the German army occupation of Paris, but returned two years later. His wartime watercolors reflect the more somber mood of the times, showing German soldiers on parade, rounding up suspected terrorists, and seated in the sidewalk cafés formerly so representative of the leisurely tenor of life in the French capital. In 1943 Spat was able to escape occupied France, and in 1945 he arrived in the United States, where he took up residence in New York City and married. The following year, the Carroll Carstairs Gallery in New York held an exhibition of Spat’s watercolors of Paris; several other gallery shows followed in both the United States and Paris. The artist continued to paint Parisian scenes after he left France, using the loose brushwork and bright colors critics described as “impressionist.” Spat’s paintings occasionally come to light in the American market; thus further information about this shadowy artistic figure eventually may surface. Terra suggests that Spat may have been born in France. What remains consistent among them is the 1890 birth date and his death in 1967. I should be content with an amalgam of the lot and call the job done. I, for one, believe this brief chronology of genealogical documents presents a far more nuanced and interesting sketch of artist Spat. And it took slightly more time to type it here than it did to find and preview the documents themselves. My obligation to Mr Patlajan/Spat is on its way to conclusion. But the question tonight is simpler: Is it personal vanity that causes me to share it with you? Who are you British and other foreign visitors anyway? The stats on my dashboard only tell me what countries have visited this blog and the pages viewed. No more than that. The former posterous.com blog site was linked to google statistics, so I could at least see what cities were checking in, but google.statistics doesn’t woirk with WordPress. So all I can do is ask: Who are you? Feel free to stop and chat a while. New Age advocates are inclined to credit our animal companions with senses lost in human evolution, or at least supressed by the sophistication of contemporary life. Baltimore artist Jerome Atherholt hints at this, as the cat on the landing witnesses sprites and spirits active while the rest of the household sleep safely in their beds upstairs. Agnes Schoenfeld’s cat “Clara” is a typical American shorthair, but unlike many of her fellow felines, she often seems to intervene in human affairs. Darting suddenly from beneath a shrub, strolling divertingly along a fence top, Clara has garnered a reputation for averting what might otherwise have been disaster. She claims our attention just long enough for the accident to pass by. After graduating from the Schuler School of Fine Arts in Baltimore, Jerome Atherholt became one of its faculty. More recently he has shifted into the world of computer games as both designer and actor, while still maintaining a career as an active gallery artist. He exhibits in Washington, DC, Baltimore and New York. This small commercial building at 12 NE James Avenue began its life in the 1880s, though its most famous occupant was the dress shop of Grace Arbogast. After graduation from Agincourt High School, she traveled east, first to Chicago and then to New York, where she found work in millinery and eventually as an apprentice stitcher in the garment industry. By the age of twenty-five, Arbogast had introduced her own design label—”Grace”—and attracted an Upper East Side clientele. In the late 20s, Arbogast returned to her hometown, renovated the shop on NE James and employed many local girls and young women in the production of high fashion design. 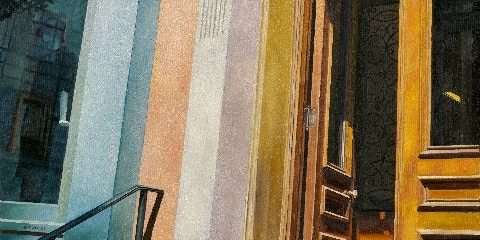 “Open Door” is a fragment of that shop front. With a BA in graphic design from Iowa State University in 1984, Twin Cities artist Mike Welton began his career in graphic design. A lack of creative outlet combined with travel to other Midwestern “Rust Belt” cities exposed him to the rich design heritage of 19th and 20th century urbanism—especially signage and the detail of pre-modern architecture. His work groups naturally into three categories: signs, buildings and what he calls “urban extracts”. “Open Door” is one of those extracts, showing a fragment of the building as it is, with subtle details that can only be appreciated at a pedestrian speed and scale. But the ghostly manequins not seen in its windows since Arbogast retired in the 1950s are spectral hints that the past is always with us. Born in what is now the Czech Republic and at least partially educated in the United States, Jan Vondrouš returned to Europe for the bulk of his professional life. Known primarily as an engraver, he produced small cityscapes of Prague, Venice and Ypres and even smaller representations of historic views on postage stamps for Czechoslovakia and Moravia during its occupation. 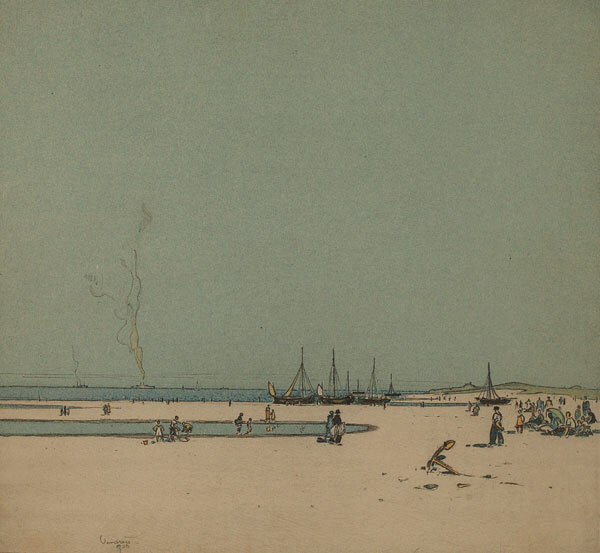 “Beaches” is an almost minimalist depiction of a coastline with boats and people in various activities—some at work, others at play—in pale shades of blue and tan. Landlocked at the center of North America and lacking any exposure to costal vistas such as this, it shouldn’t surprise us how many works in the Community Collection involve large bodies of water—rivers, lakes, seas—and waterfront situations, sailing and bridges. Though “Beaches” was printed in 1936, it was acquired from the annual exhibit of 2010.